The only question you'll be asking at D.C.'s Yola ($) is for seconds. This new café is a twist on the typical coffee shop. There are muffins, coffee, and Wi-Fi. 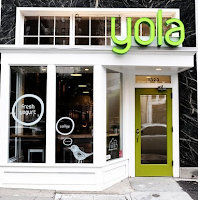 The biggest draw to Yola is their yogurt bar. Don't worry- it's not yet another frozen yogurt shop. Yola only serves fresh, seasonal yogurt. Choose between the all organic yogurt flavors, including strawberry, black cherry, peach, maple, natural Greek, or plain. Servers scoop up your choice of flavor into a tall plastic cup. Now, for the fun part...toppings. The best part? You get an unlimited amount (as long as it all fits into the cup). I chose natural Greek yogurt with agave nectar, blueberries, coconut shavings, kiwi, raspberries, strawberries, granola, and dried dates. I would've chosen more had there been room! Other toppings include bananas, mango, almond slices, muesli, walnuts, and even savory flavors such as cucumbers and dill. The café itself is very charming, with exposed brick and wooden tables strewn throughout for the ultimate coffee-shop vibe. Yola offers other tasty treats, such as pumpkin muffins and veggie pesto sandwiches on foccacia. It's definitely worth a visit if you are in the Dupont area!